The people at CANNA have our favourite plant in their blood. In the seventies and eighties, when we mostly grew outdoors in The Netherlands in a provisional way, the founders of CANNA were already pioneers, working with plants scientifically. Their university educations in biology, chemistry and agronomics, complemented with 30 years’ experience and a love for plants has made CANNA what it is today 'the undisputed number one in the sector'. CANNA will continue to innovate and strive to produce what are qualitatively the best possible products. CANNA Research has been conducting research to find agents that stimulate plants since the beginning of the nineties. This included putting plant stimulators from the horticultural sector that already existed; however, these products offered no benefits to the way we cultivate. At the end of the nineties and the beginning of 2000, various brands introduced their booster products in the Netherlands. Regardless of whether they were effective or not, a positive feeling was created among growers regarding the products. Boosters were seen as an essential link in the growing cycle. However not all boosters produced positive results! The activities of CANNA Research focused on increasing the rate of the metabolic process in the plant’s cells. This affects the taste, more sugar production and increases yield. Further research was inspired and supported by the wishes of CANNA growers who really wanted a top quality booster and had only been using PK 13/14; the minerals that stimulate flowering, up to that time. Years of research to find an effective product that gave the plants a boost eventually yielded fruit. 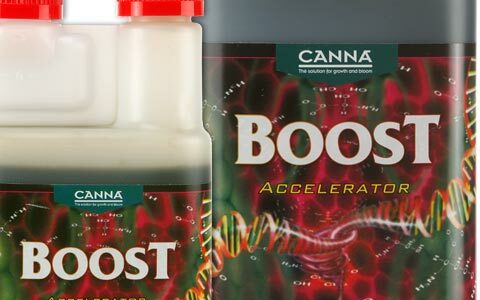 CANNA’s research led to the development of the CANNABOOST Accelerator, which was introduced in the Netherlands and across Europe at the beginning of 2006. This is a product that distinguishes itself from existing booster products in every aspect. The combination of CANNABOOST Accelerator and PK 13/14 ensures higher yields. PK 13/14 provides the plant with extra minerals for flowering, while Boost Accelerator ensures that these elements are used to convert more organic material, which makes the tops fuller and more beautiful. The decision to use a booster product should be carefully considered. Why? The fact that booster products entail higher costs immediately creates a pattern of expectation. Since CANNA sincerely aspires to fulfil these expectations in an honest way, we advise our growers to take the following tips into consideration in order to avoid disappointment. First research what the restricting factors could be and try to find solutions. This is guaranteed to generate higher yields. You should only consider a booster once the whole system is functioning optimally. CANNA growers talk positively concerning their initial experiences with CANNABOOST Accelerator. This product adds visible value to the plant and particularly the end product: noticeably higher yields, fleshy fruits, fuller taste, improved immune system and it’s ideal for use in combination with CANNA PK 13/14.